Discussion in 'General Reef Topics' started by Matt Rogers, Apr 23, 2013. 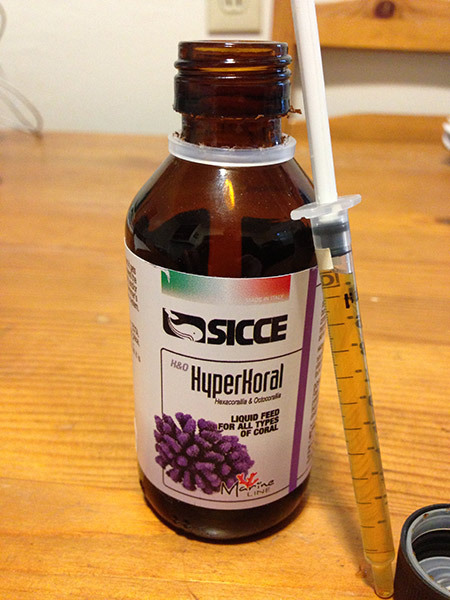 I began to feed Sicce's HyperKoral to my reef aquarium a little over 5 months ago. During this time I have done my best to keep all other variables the same in my aquarium along with maintenance routines in order to best judge the effects from dosing HyperKoral. Growth shots and full review below. Previous experiences with traditional coral foods led me to HyperKoral. Target feeding often turned into battles with my cleaner shrimp and could spike algae blooms. However HyperKoral is an amino acid based supplement formulated with vitamins and minerals that does not require direct feeding. This food is absorbed by corals by simply being in the water column. Even better, HyperKoral will not affect your protein skimmer and has been engineered to not promote cyanobacteria. all of their nitrogen needs by absorbing amino acids and inorganic nitrogen compounds from the water. HyperKoral provides the amino acid building blocks that corals need, in a form that is readily absorbed, does not contribute to organic pollution and does not stimulate undesirable cyanobacterial growth. Application could not be easier. The instructions call for 1.25mL of HyperKoral per 30 gallons of water every other day. Seeing mL reminded me I had a clean syringe from an old test kit. As I have about 28 gallons of water volume, filling the syringe to the top is my routine as this is over 1mL. I try to do this in the morning before work before the lights go on. The instructions mention dosing when the lights are off but I recall reading a study published on Advanced Aquarist that said otherwise so I think I am falling in the middle of all that and seeing positive effects all the same. Dosing HyperKoral is a nice experience. 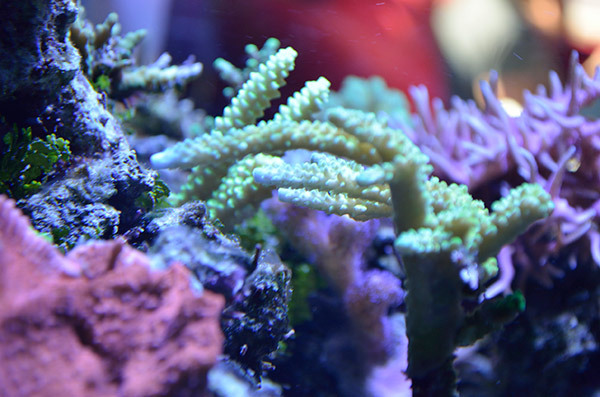 You don't have to wait until polyps are out, turning pumps off or fighting fish. You just put it in. I've done it over a hundred times now and it never gets old. Almost every time I smile and think "This is nice." Another nice touch is that Sicce says you can safely dose 3 times the normal amount if you wish. Although the instructions say this is for rapid growth, I tend to take advantage and do a double dose when I miss a day along the way. Looking back, I have not missed many days in the last 5 months. It's pretty easy to remember to dose every other day. That said, if I could use my Bubble Magus doser I would, just to get the randomness of me out of the equation. However the amount I am dosing would make that hard since I can't dose less than 1mL a day. A minimum of a 60 gallon aquarium could go the Bubble Magus doser route. For those of you with tanks as small as mine, one of the few doser options that I am aware of would be the Vertex Libra that could dose .5mL a day. Moving on, let me tell you why my tank was a good test bed. Over the previous year I have just been concentrating on stability. Something that was hard to come by until I bought a doser and took the time to calibrate it for intake rates. This was the foundation. I also made serious efforts to stay on top of my maintenance routine. So for several months prior to HyperKoral my aquarium was stable and I didn't change any variables in my routine or hardware. My SPS corals faired better as a result. Over this period many began to grow but it still was very incremental. I considered feeding the corals again but held off as I didn't feel like fighting my cleaner shrimp at the time. Then my years old cleaner shrimp died. This opened the door to feeding and just about then I was introduced to HyperKoral. I ordered a 250mL bottle to try it out. I was about to lower my lights a little bit too, then I thought better of it so I could better gauge the results of HyperKoral. I began to use HyperKoral on December 19th, 2012. 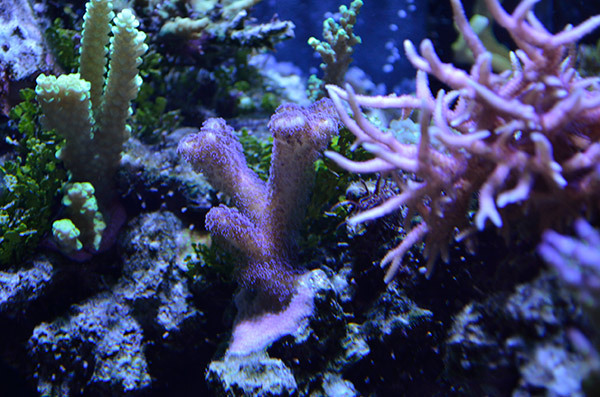 The first thing I noticed early on was fantastic polyp extension on my corals. This was observation that was easy to make. My Bird's Nest and Stylophora are very fuzzy creatures now and I can still always seem to see a little more stretch on dosing days. It's great to see. It seems like this little guy has new heads every time I look at it. About one month into dosing, I began to see something rather extraordinary to me. 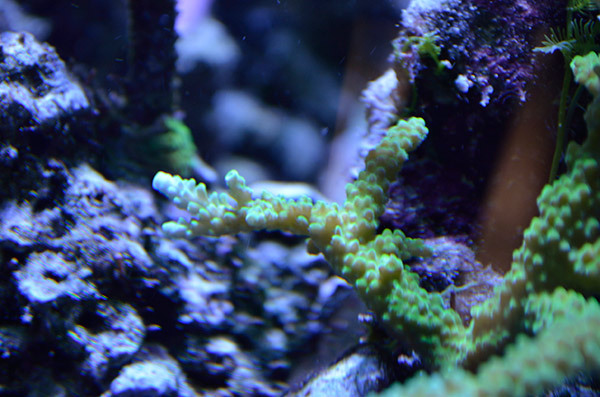 My staghorn coral - some of the oldest corals in the tank, began to color up. 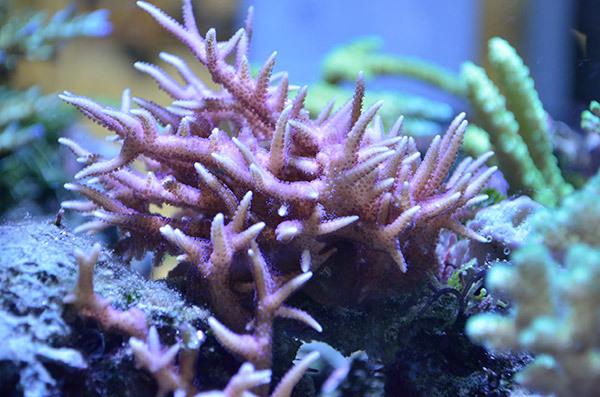 This was incredible as these corals had been through hell with UV blasts from an unshielded light and prolonged low alk periods during the pre-doser days. Their color had become quite pale and had been described as suffering from 'light inhibition.' They are now green again. 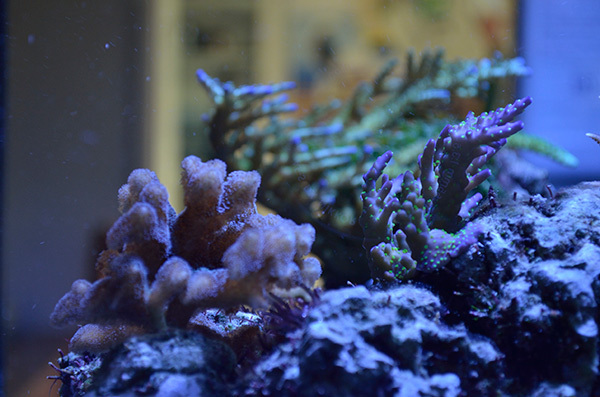 From the pink of my montipora caps to the yellow poyps and purple edges of my undata and many other acros, all the colors are vivid now in my aquarium. At about the two month mark the staghorn also has blue tip shoots running out of it in every direction. Before the growth of this coral could only be described as 'glacial.' I seem to see new tips every week now. 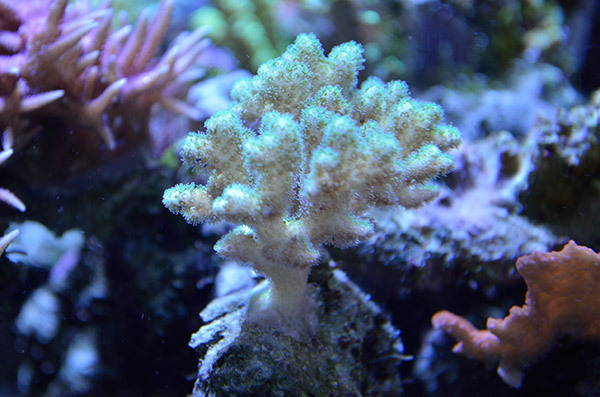 It has been a remarkable turnaround for a damaged coral. A damaged green tort. that I bought from the bargain bin tank has doubled in size since purchase in February. 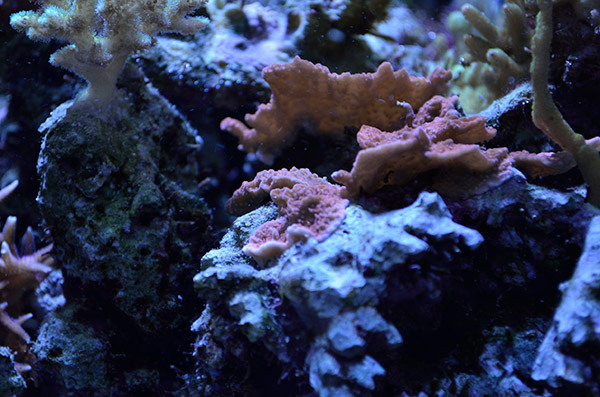 I see a lot of new coral tissue being laid down now across the whole tank. The base of my stylophora starting to pour down the side of a rock. The montirporas are laying plates down. Two Bird's Nests have grown at least 50% in a few months time. This Stylo is starting to really spread out. This Monti Cap is starting to lay plates down. This Bird's Nest was completely flat a couple months ago after a frag-cident. All vertical tips are new. Granted several of these corals are considered fast growers but I have to emphasize that growth in my tank prior to HyperKoral dosing was very, very slow. I think much of this had to do with the early days before I stabilized the tank, not feeding the corals and having my halide at 12" over the tank and not 10". 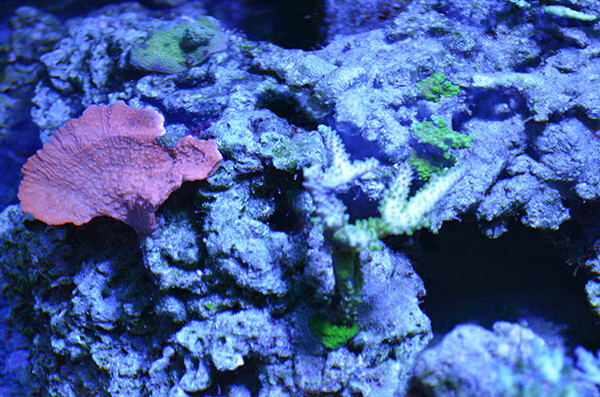 That said, with HyperKoral, the coral growth is so pronounced that I notice differences on a weekly basis now. This is even with my light higher than I want it to be. I am excited to get this review out so that I can lower my light a bit and note the difference in growth as it is already strong. HyperKoral is ideal for SPS corals but will also benefit other types of corals when supplemented with protein such as plankton. 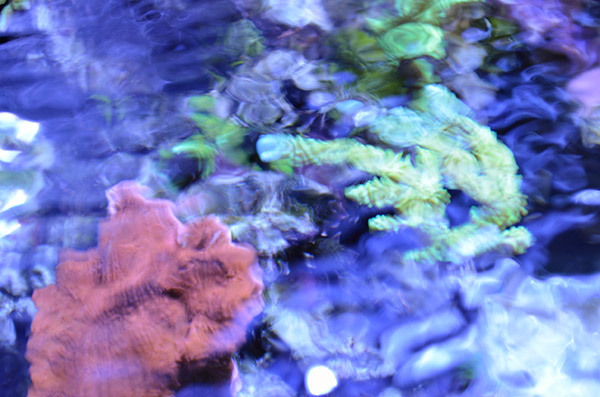 When considering HyperKoral for your aquarium, you have to consider the cost. The 250mL bottle runs at about $65. Compared to many of the nearly pint sized supplements you can get now, that is expensive. 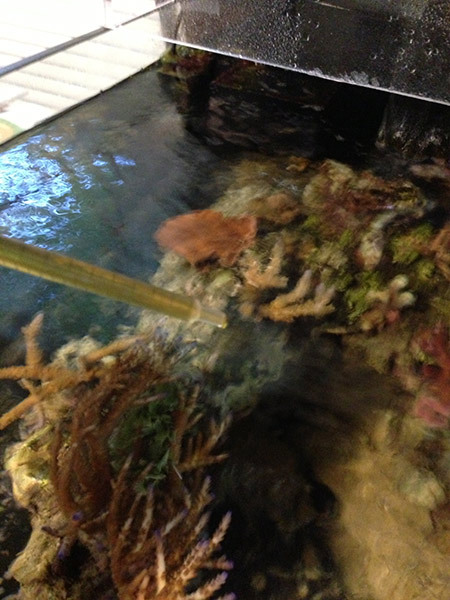 However… if you have an aquarium like mine - 30 gallons or less, you get 200 doses at 1.25mL. That is over 1 year of dosing for $65. So for the nano crowd, Sicce's HyperKoral is a very valid option. However, the cost of HyperKoral will quickly scale for bigger tanks. If you have a 225 gallon aquarium, you will get 26.6 doses out of that 250mL bottle. About 53 days worth. That is about $447 dollars a year at the 250mL bottle price or $401 a year at the 500mL price. (You might be able to find the 1000mL refill bottle for further savings.) This may be worth it to some for the growth or if you use HyperKoral as your only coral food. For others, it may not be a valid option due to cost on big aquariums. - Availability (one online retailer found?) LFS list may be found on Sicce USA site. 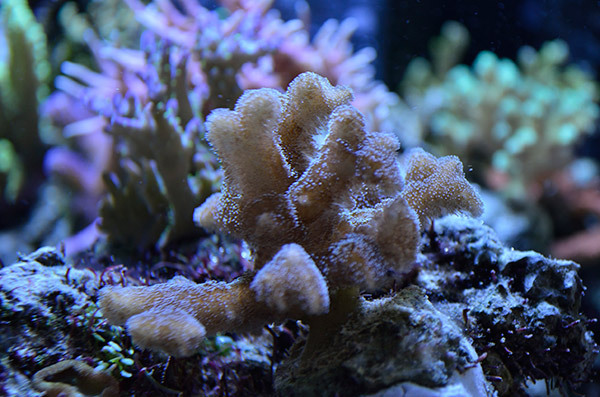 After months of use, I am convinced that Sicce's HyperKoral is a home run for nano aquariums like mine with a lot of SPS coral. Ease of use and storage - as well as noticeable results have tipped the scales for me. I can't imagine a much easier or effective food to add to your aquarium. And not affecting your protein skimmer and no algae outbreaks are big pluses too. When this bottle is gone I will be ordering another one. Wow Matt that's amazing growth. Was there any increase in phos or any negatives you can think of. Thanks! The only negatives I can think of are listed in the Breakdown section above. Phosphates would have been an interesting test. My hunch is by design, you won't see that with this. My LFS is an authorized Sicce dealer, I'm going to check if he carries this next time I pop in. I'm guessing it does not need refrigeration either? No sir, it does not. Instructions say "... dark, cool place." I keep it in my cabinet. What online retailer sells it? I am dosing (just started) Seachem amino acids right now. If those work for me, I may consider stepping up to the Sicce product.